Edit: This got picked up by the New York Post - hi to everybody who clicked through from there. An idea oft floated around the internet is: "if you avoid buying your daily latte and instead put the money in a savings account, you could be a millionaire by the time you retire." I think it was the book "The Automatic Millionaire" by David Bach that first popularised the idea. I'm not going to argue that it's not worth saving money on non-essentials (although if you're in dire financial straits you probably don't need to be told this - contrary to some oddly popular rhetoric, people with low incomes do tend to also spend less money, especially if they are unemployed). What bothers me is that, at realistic interest rates, you're very unlikely to make it to a million pounds. You'd save a lot of money, but you'd be far short. Other people have also written about this, but I thought I'd quickly break down the maths. 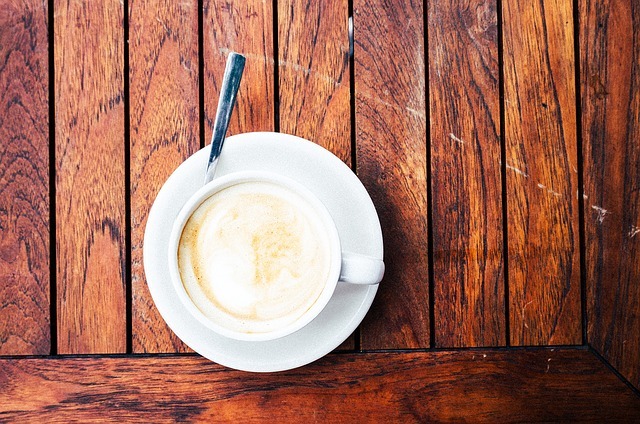 Say you spend pounds on a latte every day (in reality, probably around £3). Instead of buying this latte, you decide to invest the money in a savings account with an interest rate of (probably between 3-6%). After years, you will have £ . So how do we work this out? At the end of the first year, you put in £ . In the second year, you'll get the first amount with interest, plus all the money you've added in the second year. The next year, you get all of that money with interest, plus your new deposits. Don't get me wrong, £318,135.57 is not chump change, but it's less than a third of the way to a million. In fact, if you wanted a million pounds from a £3 latte habit, you'd need an interest rate of 9.6%. 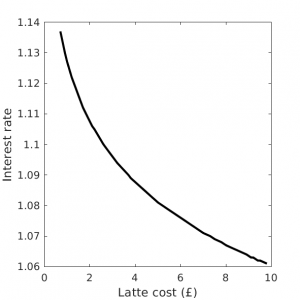 At an interest rate of 6%, your latte would have to cost £9.43. As you can see, you'd require a very high interest rate or a very expensive latte. Again, I'm not against saving money and making your coffee at home; I'm against the propagation of inaccurate mathematics. As always, XKCD said it best. Several people have mentioned that it's likely that people would only buy their latte on the way to work for 5 days a week. They'd also have some holiday days during the year. Considering how much shift work, zero-hours contracts, overtime, and working multiple jobs that people do, calculating these factors made my head hurt, so I choose instead to believe that these people go out on the weekends for a latte at the nice artisan café down the road. It has also been pointed out that finding a bank account with a 6% rate of interest is nigh-on impossible. If I've interpreted the maths correctly, this means that you won't become a millionaire unless you start buying a more expensive latte. I've always identified strongly as A Person Who Reads A Lot, so I feel like I'm supposed to hate e-readers (Kindles, Nooks and the like) and decry the possibility of the demise of the print book. Now, I will admit to having a great fondness for paper books, especially the smell. I spent many hours at our local library when I was younger - first making my way through their entire stock of The Babysitter's Club as a child, then shelving books as a teenager (which I am terrible at, incidentally - ooh! I should read this one and this one and this one...) and the smell of books always brings me right back. A paper book is also incapable of running out of batteries. However, I do have a huge emotional attachment to my Kindle - looking at it is like looking at all of my favourite books at once. I've re-read Discworld books, Little Women, Harry Potter, The Hobbit, Sherlock Holmes, Slaughterhouse 5, Dirk Gently, His Dark Materials and countless more on that little machine, as well as reading lots of new books and short stories that have become new favourites. I even persuaded Philip Pullman to sign it! My e-reader was a very welcome birthday present from my dad in 2012. It's a 4th generation Kindle - it's got an e-ink rather than back-lit display, plus wifi for getting new books, but no keyboard or touchscreen, so trying to use the installed browser is futile. I think this is the perfect combination - it's about as amenable to internet browsing as a real book, but I can still get books delivered to it wirelessly, and it feels like reading paper, not a screen. The battery life is also very, very long. I've read a lot of books on a laptop screen and even on my phone, but my e-reader makes it far easier to escape the real world. I think you can buy Kindles from around the £25 mark secondhand on eBay, and Nooks for about £30. Of course I wouldn't recommend buying a Kindle first-hand from Amazon, because they treat their staff terribly and don't pay taxes. I currently have 230 books on my e-reader. Can you imagine trying to fit those into your hand luggage? What do the following things have in common: indents from the carpet in your elbows, a crook in your neck, and a book falling on your face while you're lying on your back? Answer: they are all dangers inherent in the constant struggle of trying to find a comfortable reading position. You have to shift position at least once an hour to avoid permanently breaking yourself, and eventually you run out of positions. Once you remove the constraint of having to hold the pages open, however, you open up a whole world of possibilities. My two favourite new positions are lying on my front with a pillow under my chin, and lying on my back with the reader propped up by its case on my stomach. I realised a while ago that most of the books I've bought as an adult have had tiny, tiny fonts. In fact, this seems to be a feature of grown-up books in general. Until I had the choice to read with as large a font as I'd like, I never realised how annoying this was. Once you've got a big font, you can sit with your book very far away, which opens up even further comfortable reading positions. Things I have previously used instead of bookmarks in real books: receipts, bits of tissue, yarn, sweet wrappers, pens, train tickets and, in dire circumstances, a sock. It is nice not to have to use such ingenuity. The utterly brilliant Project Gutenberg offers free ebook downloads of a huge library of out-of-copyright books. Stuck for ideas? How about Jane Austen, Victor Hugo, or Charles Dickens? The best program for cataloguing your ebooks, converting formats and transferring them to your e-reader is Calibre, which is free and cross-platform. Did you know you can subscribe to magazines on your e-reader?? I discovered Fantasy and Science Fiction magazine a while ago and it's been a source of great entertainment ever since. It comes out every 2 months and costs £1.98 per issue, and it usually contains a mixture of novellas, novelettes and short stories. Once upon a time, it used to publish Isaac Asimov, and now it showcases great contemporary authors. You can also buy it made from paper, but it costs a lot more. There are a lot of obvious downsides: the battery can and does run out occasionally, there are situations where you can't switch them on, you can't read picture books or big coffee table books, and footnotes are a total nightmare. However, as a book lover, my e-reader has had a huge positive effect on my life. 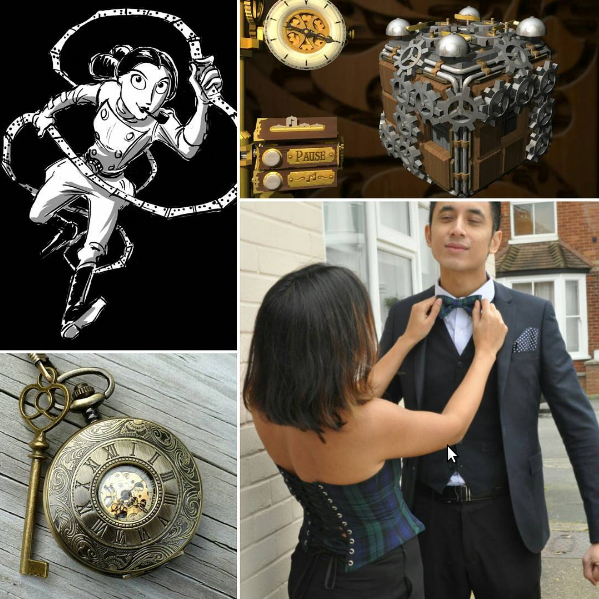 I feel a bit weird posting a gift guide, as though I've finally succumbed to the siren call of capitalism, but I love steampunk and I've tried to stick to either independent artists and shops who totally deserve your support, or educational resources. I'll start with a couple of free things: Steampunk Magazine is a fascinating publication that you can read for free online. There are nine issues to date, but excitingly it's just changed hands and Issue 10 is in the works, including a short story written by me! I think I'm right in saying that Jules Verne's books are considered to be the first steampunk novels, and because they're out of copyright, they're all available for free on Project Gutenberg. I should note that I haven't actually checked the postage dates for Christmas delivery for any of these, but I'm sure I'm not the only one who gives a lot of their Christmas presents after the holidays when I get around to visiting people. This game is available for phones and PCs, and it's a really whimsical, addictive, slick little puzzle game. 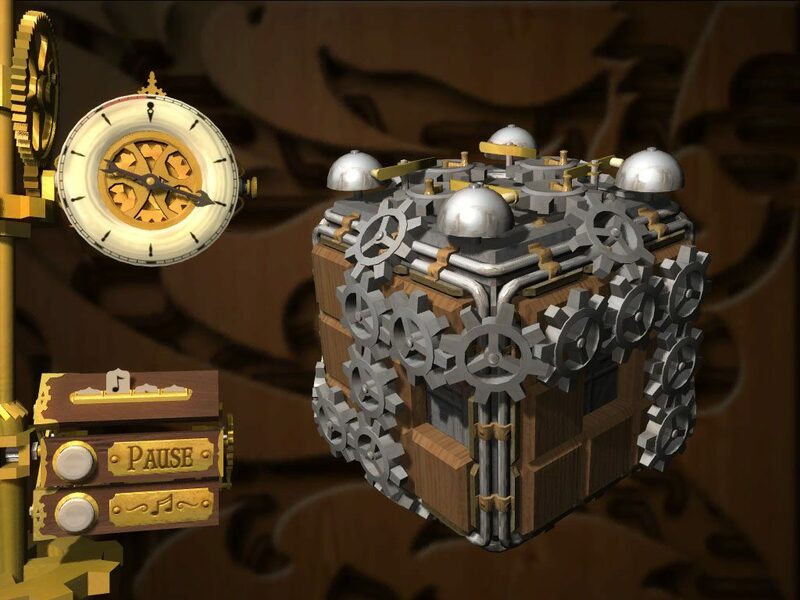 It's given me many hours of absorbing entertainment and the levels are very imaginative, with tasks like fixing a music box and building a space rocket. You play by sliding around tiles with pipes, cogs and bells on them to make a connected network. Highly recommend. 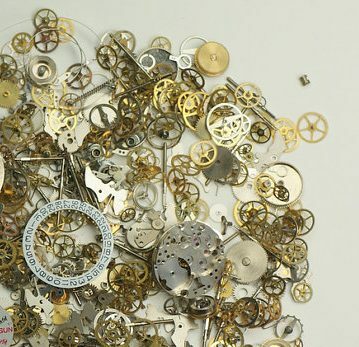 For a crafty friend, a bunch of teeny delicate pieces from disassembled watches is a great gift. These are perfect for jewellery, mixed media artwork and papercrafts. This is a goodly amount of pieces to get started with. Watch out for rogue springs that can pop up and surprise you! 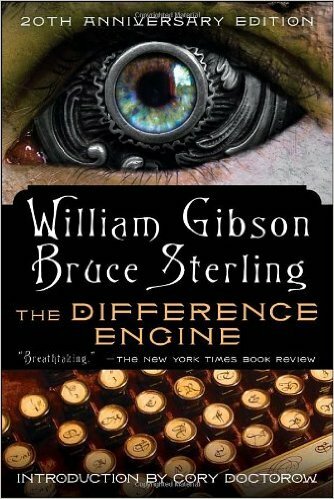 This book is an absolute steampunk classic and well worth a read. It's got a story-within-a-story structure - I found the central story, which forms the main part of the book, absolutely gripping and a really good read. The other story that flanks it is less interesting, but if you persevere through the first chapter you get to the really good part. How cute is this fabric?? 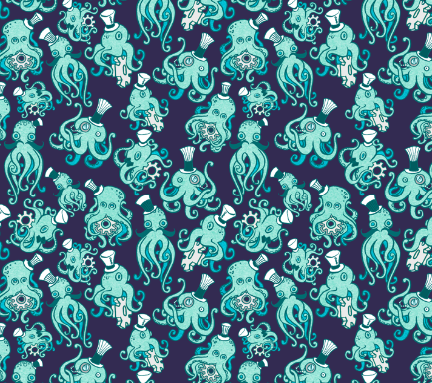 It's available from Spoonflower, which is a brill website that lets you design and print any fabric, wallpaper or gift wrap you can think of dream of. This design is available on anything from high-tech moisture-wicking sports fabric to 100% silk. It's printed in Germany, so postage isn't super expensive. 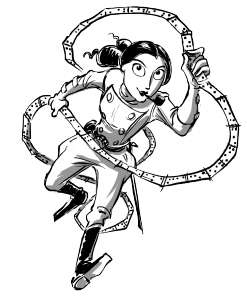 The wonderful and talented Sydney Padua (who came to give a talk at the Ada Lovelace Hackathon last year) has written this excellent graphic novel, which started life as a webcomic and grew into a huge research project. It's meticulously researched but also completely made-up (you'll see what I mean when you read it). The footnotes alone are an eye-opening look into the history of early computing, and the plot itself is consistently hilarious. 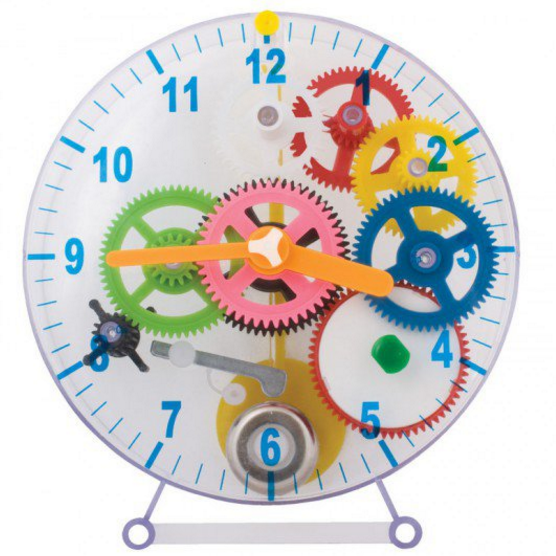 For the small steampunk in your life (ages 6+) or the grown-up who likes this kind of thing, this kit lets you make your own mechanical clock from scratch! 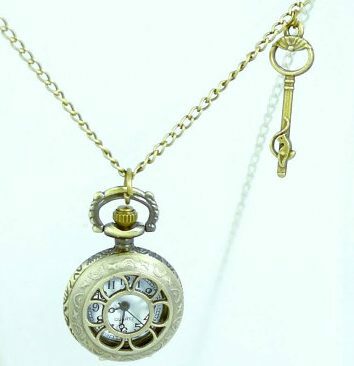 No steampunk outfit is complete without a pocket watch, and this affordable quartz creation comes with an ornate casing and its own key. 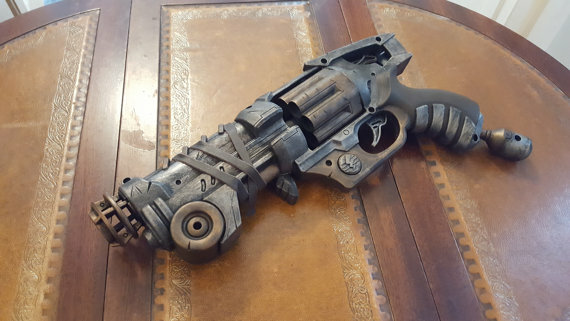 Upgrade your nerf gun battles and your cosplay with this working nerf hand cannon in distressed, tarnished silver and bronze. There's something about this weapon that I find really pleasing, it's got a great air of post-apocalyptic retro-futurism about it. 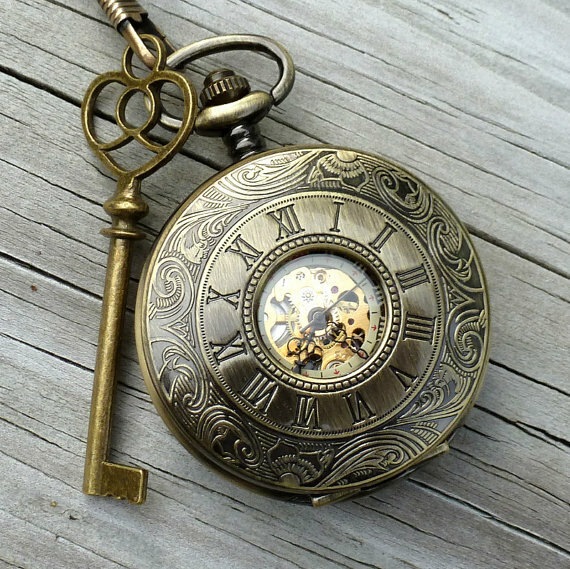 If you're thinking of splashing out on a more pricey pocket watch, how about this spectacular piece, with an exposed mechanism and roman numeral engraving? I've saved the absolute best to last: Biscuit Couture is run by a dedicated, passionate young woman of my acquaintance, who makes the most amazing, detailed corsets and lingerie by hand to order. I love this tartan bespoke corset, but she also does a bunch of other fabrics (including one with liquorice allsorts, which I am in love with). For the gentleman steampunk, she also sells her handmade ties and bow ties.